« Who Wore This Striped Michael Kors Pants Suit? One of my favorite mainstream clothing brands is Topshop. Although slightly more expensive than your run-of-the-mill street-style clothing company, their pieces are current, stylish, and youthful. She wore an adorable black-and-white floral playsuit belted at the waist and accessorized with platform ankle boots. 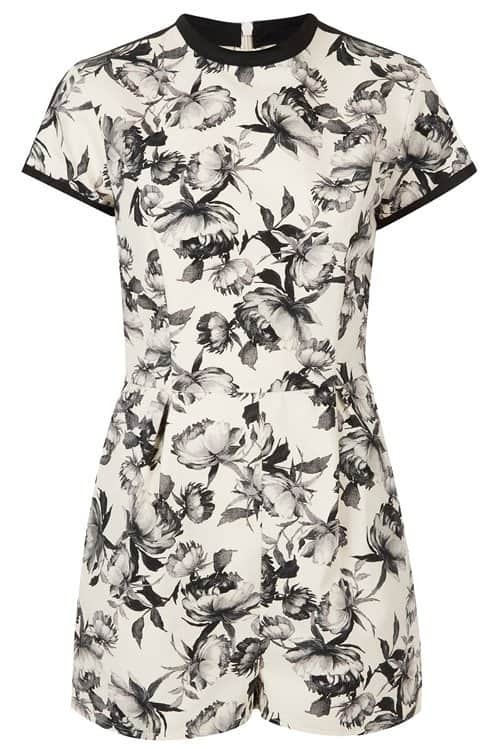 This playsuit is available at Topshop’s online store. I love the fresh and youthful look of this ensemble. It is cute but not overly so. The monochromatic palette of the playsuit plus the platform boots gave it an edgy appeal. It is also a look that is easy to pull off. For spring, you can wear it with t-strap woven flats or oxford shoes. Isabelle Fuhrman does inspire one to start wearing spring clothes early, doesn’t she?